It was a no-brainer that last summer our female foursome, dubbed “chicks with sticks,” chose the Vancouver Island Golf Trail for our annual getaway. 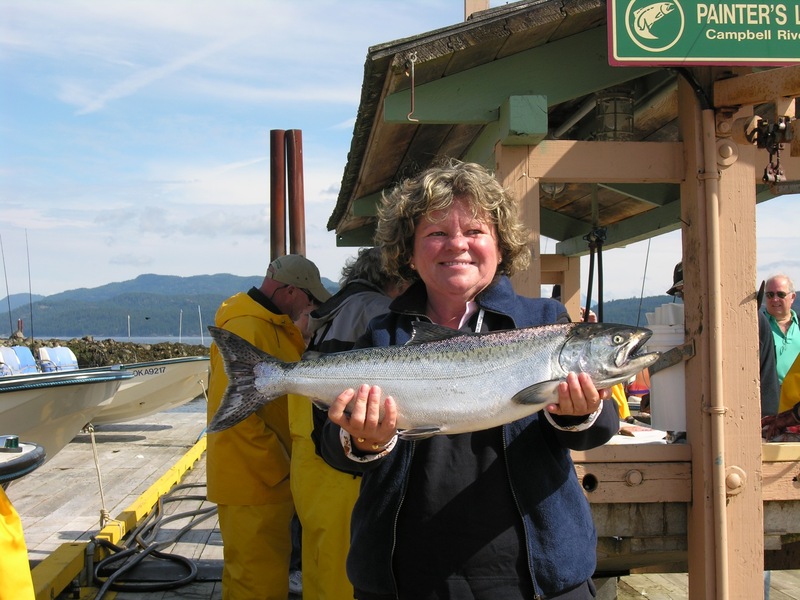 The International Association of Golf Tour Operators selected British Columbia as the “2004 Undiscovered Golf Destination in the World” and Condé Nast Traveler Magazine has ranked Vancouver Island as the “Top North American Island” for several years in a row. Considering those accolades, plus bargain play-and-stay packages featuring ten top courses, I heartily recommend that you and your pals also head west. 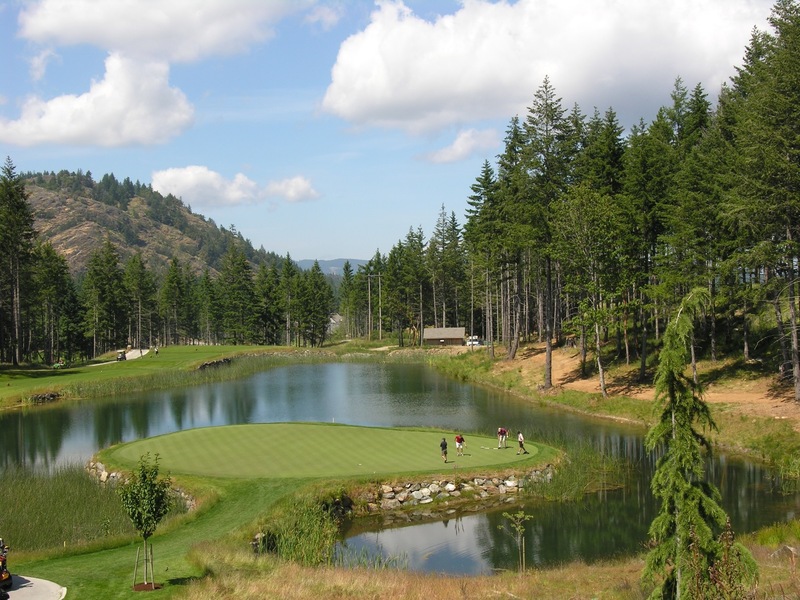 First on our hit list was Crown Isle Resort & Golf Community in Courtenay, a five-star property in the middle of what used to be a lumber town. 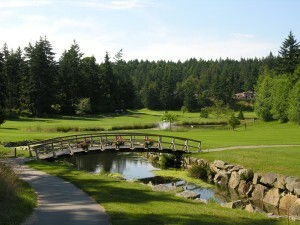 Tucked under the shadows of the massive Comox Glacier, the resort-style course, designed by Graham Cooke & Associates, is no walk in the park—especially the fifth par five with water running down the right and a fairway that rolls like an ocean swell. The posh clubhouse features a fitness centre, cognac and cigar room, antique car museum, pub and steakhouse. Designed by Les Furber, Storey Creek, by the fourth hole, had lived up to its motto, “A Course in Nature.” We’d spotted bald eagles, ravens and plenty of deer. Each fairway is carved out of its own grove of giant hemlocks and cedars. Tigh-Na-Mara Seaside Spa Resort & Conference Centre in Parksville is about as idyllic a West Coast setting as you could imagine. We checked into spacious log condominiums complete with kitchens, fireplaces and balconies with vistas of the Strait of Georgia framed by snarled Arbutus trees and towering Douglas Firs. The staff here goes out of its way to make sure you have an authentic Island experience. 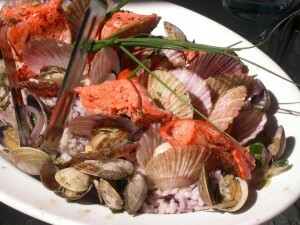 They even offer buckets, rakes and recipes should you decide to go beachcombing and steam some clams for dinner. At Tigh-Na-Mara’s Grotto Spa, we soaked our aching golf muscles in the warm mineral pool and treated our fairway-fatigued feet to peppermint pedicures. We were now primed to take aim at Fairwinds Golf & Country Club, another Furber design. At 6,151 yards, the course is a refreshing throwback to the days when golf was more Albert Einstein than Arnold Schwarzenegger. Around the canny mix of ponds, streams and strategically placed bunkers, brains usually triumph over brawn. Overlooking the Fairwinds Marina at Schooner’s Cove, we tucked into enormous platters of freshly caught Dungeness crab and garlicky Caesar salad and enjoyed the antics of frolicking sea lions. I’ve yet to meet a golf course on Vancouver Island that I don’t like, but I must confess that Olympic View, just outside of Victoria, is my favourite. From the beautifully landscaped entrance to the uphill battle on number 18, it’s sublime. 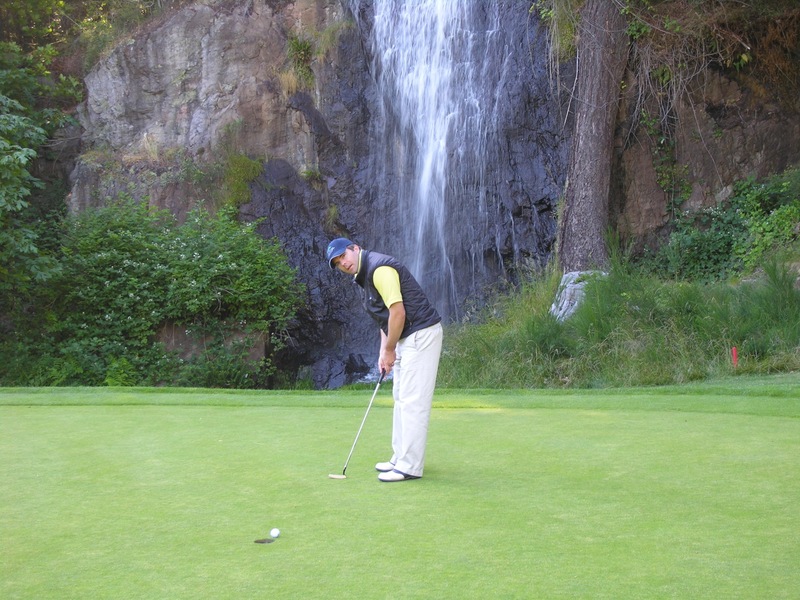 Every hole is memorable, especially the 17th, its green framed by a thundering waterfall. Undoubtedly, Bear Mountain Golf & Country Club, designed by Jack and Steve Nicklaus, has created the loudest roar on the Island. Opened in 2003, the Mountain was rated the fourth best new course in Canada by ScoreGolf (2004). At a cost of approximately one million dollars per hole, this spectacular tract meanders around rocks, rivers, valleys, forests and jagged peaks. From the Golden tips (7,212 yards) or even the forward Cinnamon tees (5,014 yards) it’s no teddy bear. On Jack’s last visit he shoehorned in a short but sweet 19th par-three betting hole with spectacular views of the Victoria Harbour. This spring the resort opens its second Nicklaus-designed 18-hole course, the Valley, thus giving it the distinction of boasting the only 36 holes of Nicklaus Design golf in Canada. 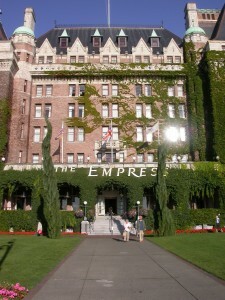 Victoria is the ideal place to end your Vancouver Island swing. I recommend the curry buffet at the Bengal Lounge, a Victoria landmark that oozes British colonial charm in the Fairmont Empress Hotel. For a nightcap, head over to Spinnakers Gastro Brewpub where proprietor Paul Hadfield has pioneered the art of handcrafted beers. Depending on the season, you might raise a pint of India Pale Ale or King Tut’s Tipple, a wheat beer flavoured with fig and star anise. Whatever your tipple, you’ll want to toast the Vancouver Island Golf Trail and pledge to come back soon. Cheers.